Pleassearaur already in the name flashes the unholy nexus--between the relentlessness of Godzilla and Pleasure, Pure and Simple. 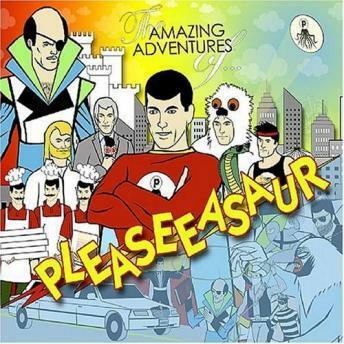 Pleasseasaur: an astonishing cybernetics in which pleasure bursts Forth as sound from the connection between a boy and his machines. Pleaseeasaur: electronically generated music that samples in equal amounts surreal lunacy and pop orthodoxy, A sonic-heterogeneity that is mundane only in contrast with the Saur himself. A veteran of concentrated and concerted touring efforts...Pleaseeasaur has amazed and alienated massive audiences across the globe. From America to Australia...from Europe to the Euphrates...Pleaseeasaur's gallant efforts in certain skullduggery have solidified their inevitable status as the world's foremost providers of perpetual pleasures. Yet in the more formative years, as the studious pupil/colleague in We're Not From Idaho, Touch Me Zoo (both with Joe Jack Talcum of The Dead Milkmen) and most recently, Pleaseeasaur, J.P. Hasson is the kind of musician who dwells in music, never permitting a potential idea to escape. He can be found at all times of the day, notepad in hand, recording impressions that be transformed by J.P. and his super-stealth entertainment strike force, (which consists of costume designer/propmaster/projectionist extraordinaire; Thomas Hurley III ) into materials for Pleaseeasaur, then dispensed with glee to pleasure-seekers of every ilk. For J.P., there can be no line of "musical influences"; Pleaseeasaur is instead the very performance of being influenced, indefinitely. Television, cultural events, conspiracy theory, video games, from the periodic table to ethnic foods, anything within his perceptual field--the field, after all, of pleasure--becomes inspiration for the Saur's rapidly growing repertory of tunes. These songs and pieces of songs will no doubt be acclaimed by critical forces interested in enumerating and defending instances of the so-called postmodern, but as emanations of the Saur, their true habitat is the ears and mind of the hedonistic listener- To label this music would be to speak hastily.